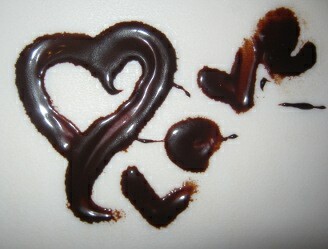 If you remember from before, I was going to make chocolate body paint as a fun, creative thing to do with the Husband. Tonight was a good night to try that again. The kids were in bed, Husband had dosed off in another room, dinner dishes were done, and there was peace in the house. What’s more, I knew I had a spare paintbrush that had never been used that would be perfect. As I dug into the cabinet for the right pot, I dropped a metal lid. The sound echoed through the house. I stopped. No sounds. I hadn’t disturbed anyone. I continued. I pulled out the recipe (this is the recipe, by the way), melted the sugar (which took longer than I thought it would), removed from heat, added the butter. So far, so good. Added cocoa and vanilla. Still OK. For the small amount of alcohol the recipe called for, I decided to use creme de cocoa. I tried to pour the half teaspoon into the pot, but it splashed more than I intended, and so added about 3 times the amount I meant to. Whoops. OK, not a fail yet. Yes, it now tastes a little funny, but it’s still workable. No problem. At this point, I figured it was a good time to go wash the spare paintbrush I had. I picked up and found the bristles to be…crisp. Not crisp as in new, crisp as in been used. Also, glittery. It was glittery. Crap. I had given it to one of the kids for his glitter paint and forgotten about it. Try it with fingers…works OK, not great. Well, alright then. Paint in a jar, lid on the jar, and into the fridge it goes. Stopped by to say Hi!